The fictional CEOs and top executives on film and television live fantasy lives of luxury and indulgence. Think Miranda Priestly's chauffeured town car and high-fashion wardrobe, Christian Grey's private helicopter, Don Draper's expensive scotch, or Jack Donaghy's finely tailored suits. However, when it comes to your own office, the company CEO is probably living more modestly. Only 1 in 5 executives (20 percent) consider a business suit typical office attire. Most executives (57 percent) choose to wear business casual clothing, while 18 percent even regularly wear jeans or shorts to work! Of course, this study did not provide information on what those outfits cost, those executives' business casual clothes could be from the Gap or from Bergdorf's. However, no matter what the cost, a boss in a business suit makes a different impression than one in jeans. When it comes to CEOs' favorite color, black is the new black. Black is the top clothing color choice for 32 percent of executives, followed by navy blue (31 percent), and grey (10 percent). Most chief executives aren't getting personally chauffeured to the office. According to the survey, only 3 percent or less do. 79 percent take themselves to work in their own automobile (often SUVs, mid-sized sedans, or luxury sedans), while 18 percent choose more environmentally friendly options. 9 percent take public transportation (bus or train), 4 percent drive hybrids, 4 percent walk, and 1 percent ride their bikes. The most surprising part of the study might be CEOs' modest habits when it comes to food and drink. 42 percent, nearly half, say they typically bring their lunch from home, while 22 percent say they get lunch from fast food places. 14 percent get their lunch from a sit-down restaurant, while 10 percent say they don't usually eat lunch. As for company happy hours, more than 3 out of 5 executives (62 percent) completely abstain from drinking alcoholic beverages. Perhaps executives prefer to maintain a sober, commanding authority, but whatever the reason, they are not reaching for the top shelf liquor. Many are choosing soda (23 percent), water (19 percent), coffee (13 percent), or nothing at all (7 percent). As for the senior leaders who do choose to partake in alcohol at company happy hours, 13 percent relax with beer, 13 percent with wine, and 8 percent with mixed drinks. When the top brass were asked how many hours they work in an average week, fifty-eight percent said they work 40 to 49 hours a week, 32 percent said they work 50 hours or more, and 9 percent said they work less than 40 hours a week. 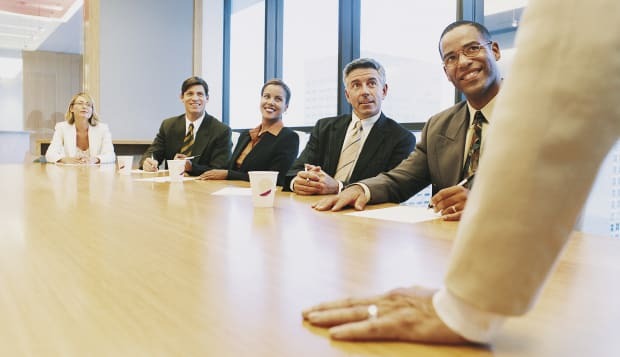 "It was interesting to see that most executives (67 percent) work less than 50 hours per week, when I think a lot of us assume executives work around the clock," said Mary Lorenz, Corporate Communications Manager at CareerBuilder. "These findings tell us that perhaps getting ahead isn't necessarily about working harder, but working smarter." Fitting in time for working out was also a priority for executives. 82 percent say they fit in one workout a week, while 39 percent workout four or more days a week. It makes sense, staying healthy and physically fit is advantageous to keeping a top company position. "I think this study is a good reminder that CEOs and other senior executives aren't these untouchable beings," adds Lorenz. "They do, however, understand that while hard work is key to getting ahead, conducting yourself in a way that commands respect and denotes professionalism is important too. The way you dress and act is often seen as a reflection of how seriously you take your job - and how seriously you take those around you as well." So if you're looking to rise in your company, look to the top executives for direction on dressing the part and how to conduct yourself like a leader. In the meantime, don't be surprised if you see your company's CEO crammed on the subway with you during rush hour, or bringing a modest brown bag lunch.